Rotherham have until 6pm on Thursday to contest a Football Association charge for their scuffle with Millwall at the weekend. A late challenge by Millers skipper Richard Wood on goalkeeper Jordan Archer sparked the melee during the 0-0 draw at the Den. Wood got booked for the tackle, which Millwall boss Neil Harris thought should have been a red, calling it a “horrendous” challenge. The club, along with Millwall, have been sanctioned with “failing to ensure their players conducted themselves in an orderly fashion” and are considering their response. Boss Paul Warne has been reflecting on the January transfer window, where the Millers were only able to get Northampton midfielder Matt Crooks through the door. They were trying desperately to add another striker and a winger but Warne came up against a number of obstacles, including other club's moving on their targets and players choosing to stay in their club's reserves side. 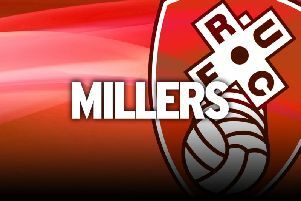 It is no secret that the Millers are not on a level playing field when it comes to their prowess in the transfer market and can be blown out of the water by most of the other 23 clubs. “The Championship is crazy money at times,” Warne said. “Realistically, without talking figures, if Cardiff and Huddersfield want to sign striker and Man United come in it's game over. “And similarly, the depth and differences in this league are a joke. Stoke spent £33 million or something in this window and that is beyond anything anyone else can imagine. Similarly Warne insists that there are other factors as well as the financial one at play, which all in all makes player recruitment a thankless task. “It's not just about finances, if I had billions then great, but it's not just about finance,” the Millers boss added. “If I am competing for a player and Sheffield United are competing for a player and Stoke are competing for a player and we are all offering the same money and it's a loan deal, I can understand why the lad would chose another club because they are higher up in the league, they have got more chance of winning, they might play in front of 30,000.